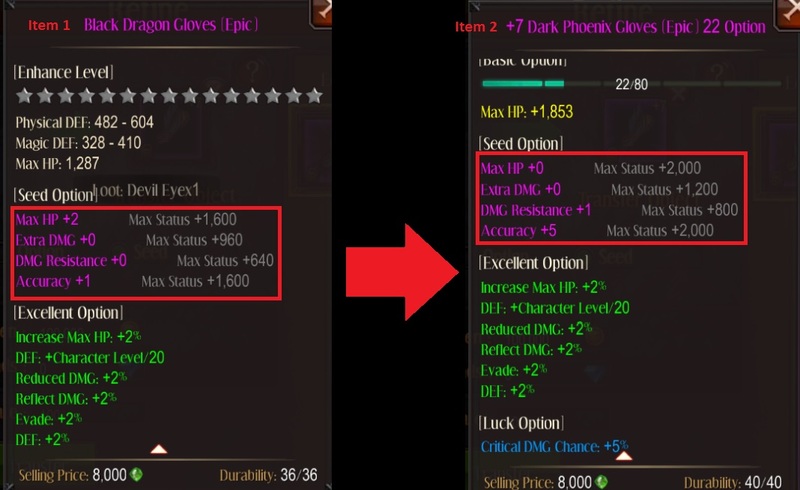 ENHANCEMENTS - The current upgrade or +'s of your gear. It increases the overall stat of your equipment. You will need Jewels of Chaos, Jewels of Bless and Jewels of Soul for this process. The maximum level for enhancement is +15 as of this moment. Unlike Enhancements, each gear has an Option Level wherein the requirement per each level increases. SEEDS - This provides additional Seed Option to the equipment. The enhancement however the bonuses is randomized so expect that it can still decrease/increase/maintain existing Seed enhancements to your equipment. 3. Choose the option you want to transfer by tapping on the radio button. Keep in mind that you can either use UNBOUND DIAMONDS or BOUND ZEN for transferring. If you want to transfer a specific upgrade, always change the button before tapping on transfer. Transfer may also FAIL. It rarely happens but it still happens. Seed Transfers will OVERWRITE the existing Seed options on the item. In this image, we have Item 1 (Black Dragon) and Item 2 (Dark Phoenix). Item 1 has Seed options (and 0's on the other 2 options) and these options will be transferred to Item 2 with existing Seed options, too. Now, most people would say "the seed options from Item 1 will add the existing seed options on Item 2" which is false. 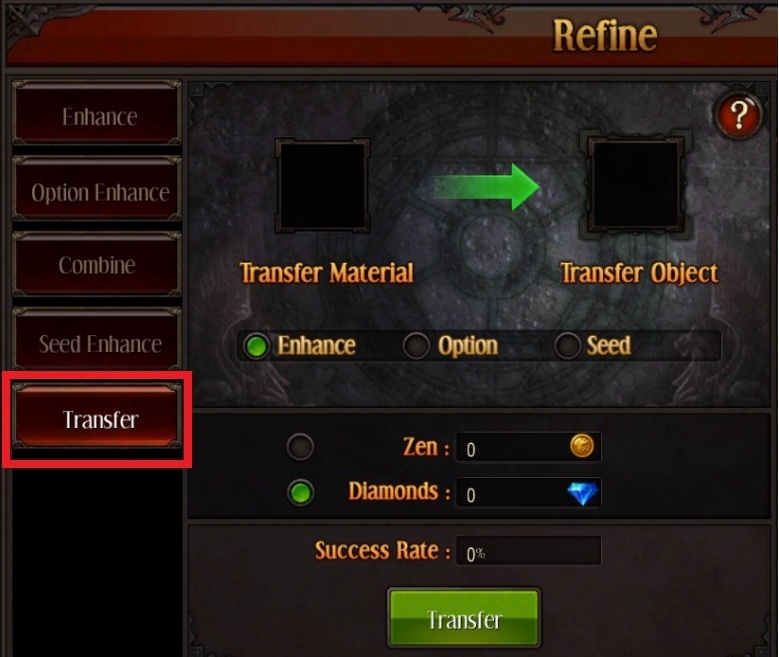 Using the literal meaning of the word Transfer, it will only move the EXISTING OPTIONS FROM ITEM 1 to Item 2 instead of adding it. As you can see on the second image, the Seed options on Item 1 has been transferred on Item 2 however it did not add to the existing Seed option on the second item for God knows why. That's how Seed Transfer works in-game. When: There's no indicator whether a Special Event will include this segment or not but the trend seems to happen during a Holiday. The Enhancement Event will be active FOR 7 DAYS AND DURING THE SPECIAL EVENT. I suggest to check out the reward tables of every Special Event since and as mentioned earlier, not predictable. On the side note, the Special Event follows the SERVER TIME so it's active until the next reset. 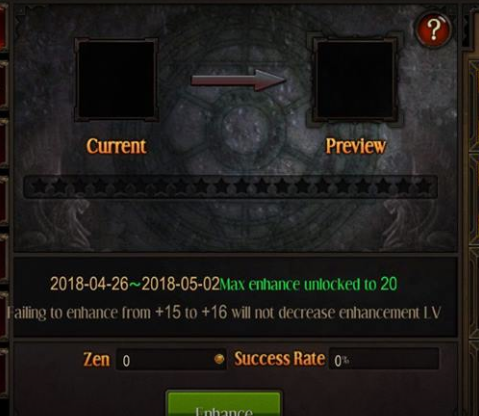 How: Equipment with an Enhancement Level of 15 will not drop to +14 during the Enhancement Event. So you can go rambo on that Enhance button 'til your heart's content. Jewel of Guardian is usable and the VIP Enhance bonus are applied on the Success Rate. ..the Special Event ended. Should I still be able to enhance my equipment after I went beyond the +15 cap? Answer: No. You will be prompted with a message as shown in the image below. ..what if I have an Enhancement Level of +16. Will it drop to +15? Answer: Once you reached an Enhancement Level +16, it won't drop to +15 so your cap will begin from +16 to +20, unless they changed it. Common mistake: unbound Zen has been used excessively and without notice. This shouldn't be new to anyone though. And no, I highly doubt the CS will assist you on that. Assuming you have a stack of Bless/Soul/Chaos, I don't think Jewel of Guardian is needed unless its a +19 going +20. Buying Amethyst and Sapphire for this event. First of all, this isn't a FORGE EVENT. Forging your T11/T12 will still fail and has a cap of +10 so it's obviously not included nor affected in this event. Enhancing an equipment with less than +15. Another common misconception about the event. Items with +14 enhancement level and below will FAIL. Removing your equipment while enhancing. Seriously, are you some sort of a witch doctor? Again, whatever your incantation you're chanting, don't. And no, they will not restore that for you because both of you doesn't share the same belief. 1. 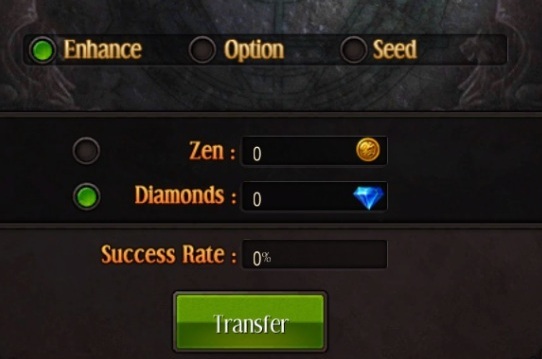 What's the difference between transferring with Zen and Diamond? 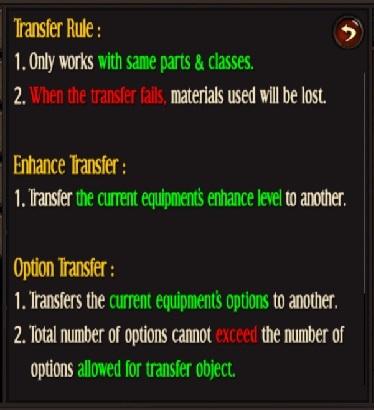 (NEEDS CONFIRMATION)I haven't confirmed this yet but I think it increases the chances of transferring from one equipment to another. 2. Do I need any in-game currency to transfer? Yes, you can also choose either BOUND ZEN or UNBOUND DIAMONDS. 3. What if it fails? Do I lose everything? No, you won't lose everything however one you choose to transfer will. 4. 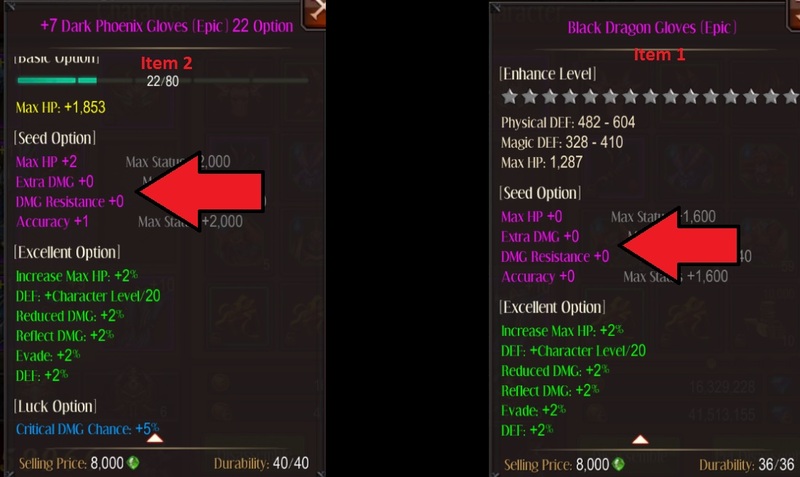 Can I transfer the enhancements/options/seeds from Magic/Rare to Epic? Yes but each rarity has a specific cap. Let's say that you have a Level 80 Option from your EPIC and you want to transfer it to a RARE item, then it will only fill the maximum cap of that equipment you will be transferring to. 6. Can I transfer the option/enhancements/seed from my Pants to my Weapon? No. It's Pants for Pants, weapon for weapon. 7. Isn't Shield considered as a Weapon? No. You don't smash heads using a shield in PVP, right? Unless this isn't MU Origin, that may be possible. 8. Can I transfer the enhancements/options/seeds from Shield to Weapon? (NEEDS CONFIRMATION) I've heard that someone was able to transfer his from Shield to Weapon. I was trying that but it doesn't work. Please confirm this. I'm using Dark Knight for this test so I may be different with the Dark Wizard class. 9. Can I transfer the enhancement/option/seed from my Wizard ring to a Dark Knight ring? No. You can only transfer these with gears under the same class so it Wiz is toWiz, DK is to DK. 10. Can you transfer "Luck" option? No. You can't transfer the luck option as it is bounded to the item itself. 11. Can I transfer my Magic Knight Enhancement/Option/Seed to my Dark Knight/Dark Wizard equipments? No. Transfers are only possible if the items are equippable to the class such as Wands/Staves/Swords/Scythes/Shields. Rune Swords (Magic Knight) is exclusively for the MK class. If this was ever possible then you'd probably see the Elf class's Bow enhancements being transferred to a Dark Knight weapon which isn't even possible since the item would probably be "Bound" for most of the time unless you're doing it consistently with unbound Jewels which is another tale to tell. Last edited by MiaoMi; 05-05-18, 09:11 PM. Thanks guys! I hope new players will find this useful too! Thank you so much! I hope you and your friends find this useful! Thanks, MiaoMi, for the great guide. I have a question about what you said above, that we are unable to transfer the luck option. Does this mean if I have an Epic shiny weapon that has the luck option, that if I get a better Epic weapon (let's say it is Shiny but doesn't have the luck option) that I can't transfer the luck option from my current weapon to my new weapon? I have noticed that some of the items with luck are very expensive. But why buy one with luck if it cannot be transferred when I get a better weapon? So confused. Thanks, MiaoMi, for the great guide. I have a question about what you said above, that we are unable to transfer the luck option. Does this mean if I have an Epic shiny weapon that has the luck option, that if I get a better Epic weapon (let's say it is Shiny but doesn't have the luck option) that I can't transfer the luck option from my current weapon to my new weapon? I have noticed that some of the items with luck are very expensive. But why buy one with luck if it cannot be transferred when I get a better weapon? So confused. You can transfer it in a sense by combining. When you combine you get next tier and luck option will also carry over. Sticky! Great job, as always. Thank you for your help. When I combine an item with luck and let's say it has some enhancements on it -- do the enhancements also carry over? Hey Badkitty, you can check my post about combining equipment. Cheers! Hi, I looked in both this guide and the combine guide, but I cannot find an answer. I have a question regarding my weapon which is currently at Option Enhance level 44. Will all 44 levels transfer over to a new weapon, or is there a cut-off for how many levels of Option Enhance will transfer? Thank you. Thanks, Friedrich. This was helpful. Based on this, I guess all 80 option enhance levels will transfer, then. I didn't know this, either! Thank you for the warning.